It is suitable for small to medium size CTI projects. The bundled IVR II 4.X flow design tools greatly reduced the design effort. By masking out low-level details, users no longer need to possess telecom knowledge and worry about it�s operation. 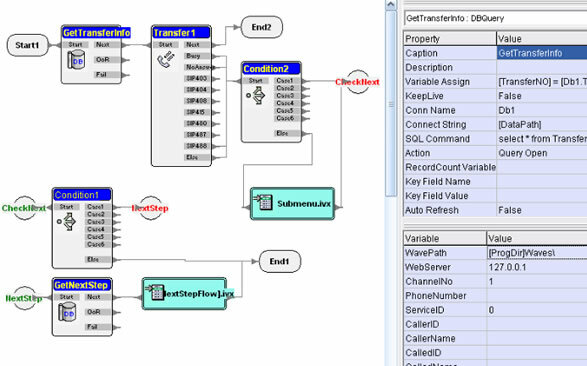 The Graphical User Interface with its drag and drop components allow designer to easily make connections of call flow sequence of his choice. If required, it can be modified and verified quickly. With IVR II 4.X, CallURL�s product opens a path to avoid expert for CTI / IVR design task. As far as a person has basic programming or logical thinking capability, he can work out a decent application by referring to demo samples. With the build-in simulation function, one can even do most of the verification without real telephone lines. The IVR II 4.X also comes with channel Monitor and logging utilities, this not only for easy real-time channel status monitor, but also serves as a good debugging tools. 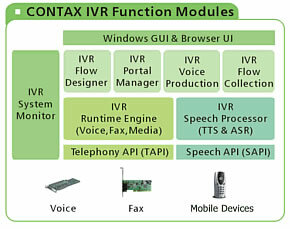 Contax IVR II is centered on its Runtime Engine that will execute call-flow assigned to individual channels. When a call is coming in, call-flow associated with that channel will be executed and end either by the caller or the call-flow design. To do this, Contax IVR II provides a collection of common �components� usually required in call-flow design. Make them available to designer�s choice. Each component has its related code implementation, when executed by IVR II runtime engine, detail operation will be carried out. Thus, IVR designer has no need to know the under-line operation and can focus on their logical design. They don�t need to worry about telecom operation any more. Contax IVR II uses GUI to allow designer pick component(s) and drag and drop them in the design panel. Connections are made to control the proper flow based on operation condition or design requirements. Interface to SQL database, web server and other resources (e.g. DLL, E-mail server, Fax, SMS, � etc.) are all �packed� as �component�, so designers can use them at functional level. 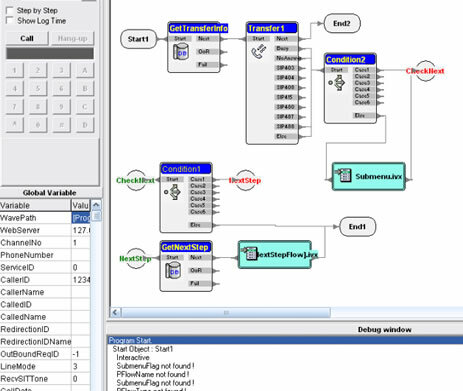 In addition, to simplify the debugging process, Contax includes a simulator that allows the call-flow to run and with its companion channel logging capability, Call-flow design can be verified before heading to the real world. To support outbound call applications, the Runtime Engine has provision to check call request entries put into its database and perform calls based on entry setting. When a call is connected, associated call-flow will be executed so that same flexibility for handling incoming calls is also on outbound calls. A schedule utility that interfaced to database is incorporated for users only doing predefined call out task and not bothers to deal with SQL database. GUI Flow-chart service creation environment Integrated. Provide more then 50 IVR flow samples, update IVR flow collection through Internet services. A number of useful IVR applications included such as Auto-Attendant, Voicemail, Auto Login etc. Multiple, concurrent line-channel monitoring with each running a different application Channel(s) can be assigned to work in inbound or / and outbound mode Line independent operation with System logs to record system activities System reports to show numbers of incoming and abandoned calls etc.